Arsenal legend Ian Wright has heaped praise on the performance of Tottenham striker Harry Kane in England’s 3-2 victory away to Spain yesterday evening. The Spurs front-man did not get on the score-sheet against Luis Enrique’s side, but had an influential performance that included a stunning assist for Marcus Rashford’s goal. Kane has perhaps not hit his usual high standards recently, but Wright thinks it’s laughable how many people had criticised him for his lack of impact for England. The ex-Gunner believes Kane silenced a lot of doubters here, showing why he’s such a ‘vital’ player for club and country with his all-round game. Wright believes there’s more to the 25-year-old than goals, with his intelligence and passing last night showing he can plug that gap in midfield by dropping deep to dictate play if he has runners off him. ‘Harry Kane couldn’t have given a better response if he’d sat down and written the script himself,’ Wright wrote in his column in the Sun. ‘It’s been absolutely remarkable to hear the way some people have been putting the boot in on the England captain of late. ‘In Seville we saw exactly why — and exactly why Kane, whether he’s banging in hat-tricks or not, is such a vital player for club and country. He added: ‘And so much for us supposedly missing that magical midfielder all the best sides have. 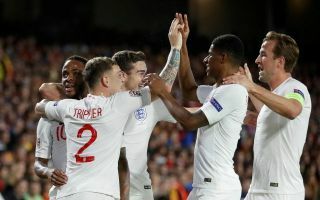 England fans will no doubt be hugely encouraged by what they saw from Kane in what was a memorable result and performance by the Three Lions, who inflicted Spain’s first home defeat in competitive games since 2003.